At least one nurse is making a splash in these midterm elections. How many more are running? Up in Illinois, a Registered Nurse is making a splash in the midterm election campaign: 31-year-old challenger Lauren Underwood has a surprise 6-point polling lead in the state’s 14th Congressional district and “is now better known and better liked than the incumbent”. Nobody knows how the election will end in reality tomorrow night, but that’s pretty impressive for a district which incumbent Randy Hultgren won by 18 points last time. Lauren had already drawn attention by easily winning the Democratic primary in the mostly white district against six older rivals as the only woman and only African-American candidate. The Minority Nurse magazine published an interview with Underwood earlier this year about her journey from newly graduated RN to health care policy advisor and running for Congress. They also queried her on issues like the Affordable Care Act (she wants to fix and keep it), safe staffing and nurse-patient ratios (which she seemed ambivalent on), and nursing school costs and student debts. We will send free gifts to nurses who submit the best Election Day selfies! Asked about her top priorities by The Chicago Sun-Times, Underwood stressed that we “must invest in comprehensive mental healthcare for our community in order to tackle the opioid addiction crisis”. But it’s not all been good press for her. She’s also run into criticism for presenting herself as a practising nurse in campaign videos and interviews, talking about “treating patients” and “giving discharge instructions,” when she worked as a research nurse but not in bedside nursing. She countered by arguing that she “spent thousands of hours working with patients” during her “clinical training and decade of nursing experience“. Her story made us wonder: are there any other nurses running for Congress? Turns out that yes, there are! Texas Democrat Eddie Bernice Johnson ‏was the very first nurse to ever make it into Congress, and she’s virtually guaranteed re-election in the state’s 30th Congressional District. Her long pre-Congress career in nursing went back to the 1950s, a Minority Nurse interview recounted a few years ago, when no nursing program in Texas would accept an African-American student and she moved to Indiana to become the only black student at a college there. Another incumbent Democratic Congresswoman in a safe seat, Karen Bass, was a licensed vocational nurse and physician assistant before becoming a politician. The Representative for California’s 37th Congressional District had a quick answer ready when asked how nursing prepared her for politics: “Good bedside manner”! Up in Wisconsin, a nurse has set her sights even higher than the House of Representatives. 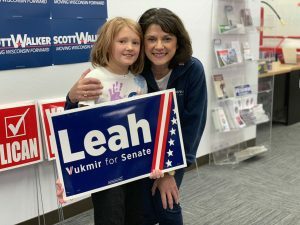 Leah Vukmir, MSN, BSN, describes herself as “a nurse, military mom, and conservative with a proven record”, and she’s running for the U.S. Senate. She’s had a respectable career in the state legislature, serving eight years in the State Assembly and another eight in the State Senate. Representing the 5th Senate District in Milwaukee’s suburbs, she narrowly won her first election but got re-elected easily in 2014 against a Libertarian challenger. This time she’s facing a more uphill battle, however: Tammy Baldwin is expected to win re-election. Down in Florida’s 5th Congressional District, registered nurse and anti-abortion activist Virginia Fuller ‏is running as the Republican nominee. She faces even more daunting odds in a seat which the Democrat won by 28 points last time, however. Earlier this year, the American Nurses Association endorsed Nurse Practitioner Heather Ross for Arizona’s 6th Congressional District, but she narrowly lost her Democratic primary race. Some Registered Nurses who had a good run in Congress have bowed out. In Tennessee’s 6th Congressional District, Republican incumbent Diane Black is not running this year, and California’s Lois Capps didn’t seek re-election in 2016. There are, however, several more nurses running for office in state legislatures. Not as many as doctors – there’s a lot of those in politics! – but here’s a few we found. There are surely more: if you know any, let us know in the comments and we’ll add them! Kathy Wiejaczka recently retired as a special education nurse and was inspired to seek political office after taking part in the Women’s March in Washington, D.C. last year. 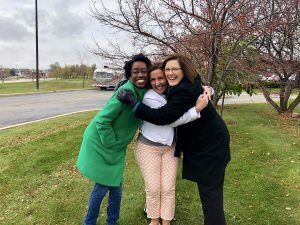 The Registered Nurse faces a competitive race in Michigan’s rural north-west, running as the Democrat in House District 101. “I always tell people I’m a nurse, and I want to serve them the way I’ve served people the past 39 years,” she explained. 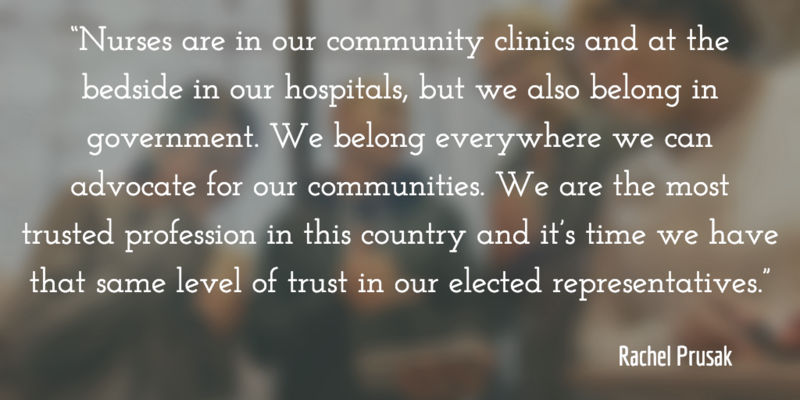 Rachel Prusak, NP, worked for over twenty years as a nurse “serving communities from inner city New York to rural Hawaii” before settling in Oregon. Much like Underwood, she turned to politics after seeing her “representative [lead] the charge to take healthcare away from the most vulnerable” when Republicans tried to repeal the ACA, and is running for House District 37. Her opponent won the Portland seat by 10-13 points the last two times, but this is the kind of suburban district where Democrats should move the needle the most. Jodi Wilke returned to college at age 50 to become an LPN. She’s now running an uphill race as the Republican candidate for a seat in Washington’s House of Representatives to represent district 24a in the state’s Olympic Peninsula. Patricia Kane is a Registered Nurse on Staten Island’s North Shore in New York City, where she says “We’ve seen a lot of beds close. A lot of services”. Having lost the Democratic primary in this open, but heavily Democratic State Assembly seat, she’s still on the ballot as Working Families Party nominee but doesn’t appear to be actively campaigning anymore. Which candidates are you rooting for?